Before Martin Luther King put his life to service and a nationwide fight for civil rights, there was Jackie Robinson, a man of a humble appearance, a great athletic talent and with the lion’s heart. 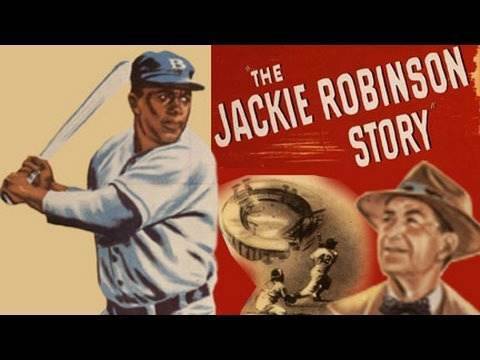 Featuring the legendary baseball player’s life story, the biopic The Jackie Robinson Story, produced in 1950 by Jewel Pictures and revived in color in 2005 by 20th Century Fox, is a cinematographic antiquity, but its message does not lose actuality till this very day. Though the film does not unveil many circumstances and events of Jackie’s life and activism, it does bring out his personality and due to one fact alone that Jackie starred in the film playing himself – and doing the job quite well – the film carries historical value. Owing to the brilliant performance of Minor Watson whose role of Brooklyn Dodgers’ president Branch Rickey required him to be convincing as a believer in the democratic character of baseball as a universal sport, and as such alien to any form of discrimination and racism, the film made history. The lines Watson had to say in one of the scenes advocating for equality in sport are now epic. Quite linear – what could be expected of a biographic film – The Jackie Robinson Story is best seen in its original black and white format; that’s a sure way to feel the flavor of the 50s, to dive into the atmosphere of the time and walk with Jackie Robinson till his monumental victory on that baseball field some sixty years ago.